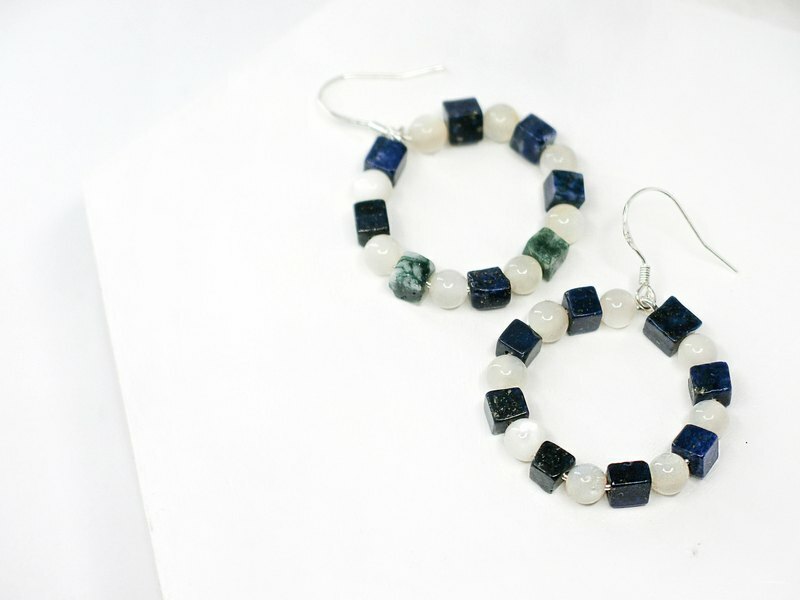 Beaded earrings 4*4m (Lattice, Aragonite), 925 sterling silver Attached with paper bag*1, velvet bag*1, intimate card*1, merchandise guarantee card*1, maintenance wipe*1 *Can be changed to clip* <Lattice> Lightweight earrings Blue's Looks The whole person has a refreshing temperament Packaging diagram: https://farm5.staticflickr.com/4751/26680305378_34ff0a2a3d_k.jpg https://farm5.staticflickr.com/4607/25680655567_9679a99171_k.jpg https://farm5.staticflickr.com/4618/40551473031_cec5b9d3e4_k.jpg https://farm5.staticflickr.com/4671/25680649007_098f2a4ebe_k.jpg -------------------------------------------------- ------------------------------------- Hand size measurement method: 1. Use a thin cotton thread to wrap the wrist at the finest place without excessive tension or relaxation, and measure the length. 2. If there is a degree of tightness that you like to wear, please indicate to the designer. 3. Product Size Limit: Total length 12cm~20cm 4. Have doubts about any length be sure to ask the designer. Material use: 1. Bracelets are all # Japan elastic silk thread. 2. There may be ice cracks or mineral patterns on the surface of natural stone. In addition, some of the natural stone in the design hall are optimized. The degree of optimization of each stone is not the same. If you are concerned, please consider it more. If not, please do not Single order! 3. Commercial metal fittings are made of 925 sterling silver, Tibetan silver or solid brass. Precautions: 1. Metal and bead may cause slight scratches and metal oxide marks due to friction and collision when worn. It is a normal phenomenon and there is no need to worry about it. 2. Natural stone will degrade the surface brightness due to long-term wear or collision, which is a normal physical phenomenon. Use and maintenance methods: 1. The metal fittings should be regularly wiped and maintained with a wiper. 2. If the metal fittings are 925 silver, please do not bring hot springs to prevent metal sulfide blackening. 3. Some natural stone hardness is not high, should pay attention to the situation of throwing to prevent natural stone fragmentation. 4. Cleaning articles are all alkaline or acidic chemicals that are not recommended for bathing or swimming. 5. When not wearing normally, wipe the product with a cloth and store it in the box. After-sale service: 1. Products are all hand-made products, no return or exchange of goods (except merchandise). 2. Each item has the opportunity to enjoy a free modification of the length of the product within seven days. The freight must be borne by itself. 3. If the goods need to be re-connected after breaking, the bead and metal fittings of the original bracelet must be sent back and a finishing fee of 100 yuan shall be charged. If the length of the missing material will be calculated as the proportion of the selling price of the goods, the freight will be charged. Need to bear it yourself. 4. If the product needs cleaning or replacement of natural stone due to long-term wear, it needs to collect a finishing fee of 200 yuan, and the replacement material is calculated as the proportion of the product price as a material fee.